As more states pass legislation legalizing and/or decriminalizing marijuana, the perception of harm is decreasing. Students may have confusion and misunderstanding about marijuana usage. 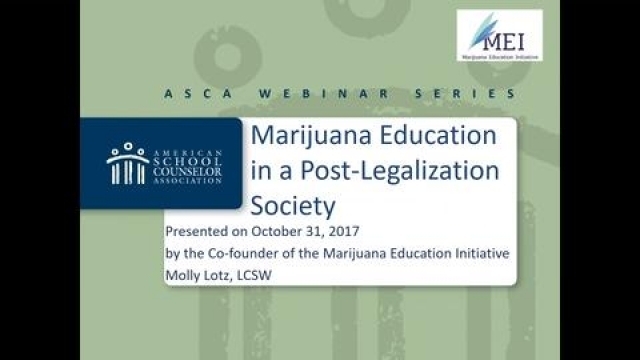 Learn how to confront the challenges associated with the changing dynamics created by legalized marijuana, both medicinal and recreational. Download accompanying handout. Discuss marijuana trends as they pertain to youth use. Explain the modalities and methods of youth marijuana consumption. Discuss the impact of marijuana on learning and the developing brain. Molly Lotz is currently a school counselor at Yampa Valley High School in Steamboat Springs, Col. After her students began asking for support in their attempts to become less dependent on marijuana, Lotz created a curriculum to help youth do just that. In 2015, she and her team created the Marijuana Education Initiative out of a passion for providing unbiased information to youth who want to know and understand the effects marijuana has on their lives.